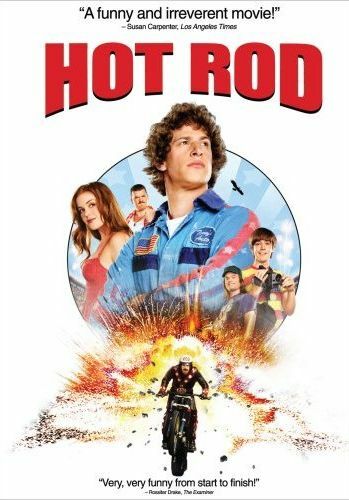 Andy Sandberg is easily one of the funniest guys currently on Saturday Night Live, so it was obviously just a matter of time before he got his own feature film. In it, Sandberg plays a character named Rod who appears to be a 20-something year old guy with the mentality of a teen (or pre-teen). He thinks of himself as this great stuntman/daredevil in the vein of Eval Knieval, yet rather than a kickass motorcycle, Rod has a dinky little moped with an engine that looks like it would barely be able to make it up a hill. Oh yeah, and it even has foot pedals for manual pedaling. So far, it's a funny premise. Sandberg not only looks the part, but also does a great job at playing the character, as he does with all his SNL characters. He's totally believable as a clueless guy who never grew up. So Rod lives with his mom, his step-brother, and his step-dad, Frank, whom he has a bit of a complex relationship. Rod loves Frank, but Frank thinks Rod is a wuss (and he is), so every day Rod tries to beat up Frank in order to prove himself a man... but each time he instead proves that he's still just a little kid inside a grown body. Then, Frank falls ill and is unable to fight, so Rod hatches a plan to earn the $50,000 needed for the operation to make him well again... so Rod can beat him up. The plan consists of three basic phases. Phase 1: get in shape. So much more could have been done with this. There are a few shots of him acting foolish, but nothing that really showed how desperate he was or showed how far he was willing to go. Instead, we'd get a scene of him being held underwater in an above ground pool for 40 seconds to increase his lung capacity. Mildly amusing, but not laugh-out-loud funny. Phase two of the plan was to earn the $5,000 they needed to implement phase three, and to earn this money Rod would hire himself out for stunts. Again, I think so much more could have been done with this. Instead of getting gigs for people who needed someone to test something potentially very painful, he got gigs for like children's birthdays and then just make up his own stunt, like setting himself on fire. So again, these were mildly amusing, but not laugh-out-loud funny. Phase three of the plan was to set up the biggest motorcycle jump ever... jumping over 15 school buses. Quite a challenge for someone who can't even jump across the short side of a swimming pool. So the whole movie was leading up to a stunt that everyone in the audience knows he can't do. Thus, there's no real reason for us audience members to look forward to it. Sandberg is funny here, but the material just doesn't hold its own. It doesn't make us laugh that often. And thus, it was a bit disappointing. Not a bad movie, mind you, but just not as good as I would have expected from Sandberg. The DVD contains some deleted scenes, most of which definitely should have been deleted. There are also some outtakes, some of which are funny, a behind-the-scenes featurette, and a commentary by the director, Sandberg, and co-star Jorma Taccone.